When I saw previews for 2015’s Hitman: Agent 47, I assumed it offered a sequel to 2007’s Hitman. Nope – instead, Agent 47 starts over the franchise. Doesn’t eight years seem like a short time between reboots – especially when the 2007 film actually did decent worldwide receipts? Yes, it does. Given that Agent 47 didn’t light box offices on fire – and received brutal reviews - I’d guess the future of the franchise remains in doubt. Still, I like action flicks, so I thought it deserved a look. In a prologue, we learn that Dr. Piotr Litvenko (Ciarán Hinds) once led a program to create perfect warriors out of genetically enhanced clones. Pangs of conscience forced Dr. Litvenko to disappear, but in the present day, a group called “The Syndicate” wants to recreate the “Agent” program and make their own super-soldiers search for him. Those who seek Dr. Litvenko’s knowledge hope to use his daughter Katia (Hannah Ware) as a tool in their efforts. While those who want to relaunch the super-soldier program look for Katia, Agent 47 (Rupert Friend) does so as well, ostensibly to kill her. A mystery man named John Smith (Zachary Quinto) comes to her rescue, but he may not be all that he seems. The story follows these threads and a variety of secrets. Video games made into movies enjoy a spotty history, and we’ve yet to see one of those adaptations really capture the public imagination. Given its “R”-rated violence, Hitman never seemed like a great candidate to change that trend, but various parties must think it comes with potential or we wouldn’t have two separate attempts to make it a cinematic franchise. Agent 47 doesn’t work especially well, and part of the problem comes from its derivative nature. Stories of super-duper killing machines abound, and Hitman doesn’t even seem original in the video game adaptation realm, as the Resident Evil series featured its own take on the elite combatant. I’m not wild about the Resident Evil franchise, but I think it musters a more creative story/universe than the lackluster narrative for Agent 47. Not only does Hitman remind me of aspects of Resident Evil, but also it hearkens back to The Terminator and The Matrix - heck, it even goes Pulp Fiction on us toward the end! 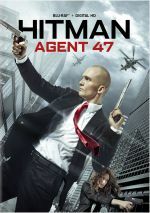 Chunks of Agent 47 seem lifted from these other franchises, and they leave the film was a consistently unoriginal feel. The action scenes can’t overcome these drawbacks. Oh, the film shows a decent sense of style, but the battles and violence never seem much more than perfunctory. Again, the “been there, done that” feel damages Agent 47, as it comes across as too predictable and derivative to create an identity of its own. Lackluster acting doesn’t help. Friend fails to deliver the requisite sense of threat or menace as Agent 47 – he comes across as soft and wimpy to be believed as a ruthless assassin. None of the other performers bring much to their roles, so the characters remain bland and forgettable. All of this leads to a distinctly mediocre action flick. Perhaps the Hitman video games are fun to play, but that excitement doesn’t translate to the movie screen via the unoriginal Agent 47. Hitman: Agent 47 appears in an aspect ratio of approximately 2.35:1 on this Blu-ray Disc. The Blu-ray replicated the source well. Sharpness seemed strong. Only minor instances of softness materialized, as the movie usually seemed concise and accurate. Shimmering and jagged edges remained absent, and I witnessed no edge haloes. Print flaws failed to appear, so this was a clean presentation. Orange and teal dominated the palette, but not to an oppressive degree. The colors were fine within their stylistic restraints. Blacks looked deep and taut, and shadows showed good clarity; low-light shots could be a bit dense but they were more than acceptable. This turned into a pleasing transfer. No complaints accompanied the good DTS-HD MA 7.1 soundtrack of Hitman. With plenty of action, the soundscape often opened up in a dynamic manner and used all the channels to positive advantage. Various vehicles zoomed around the room and guns peppered the soundscape to solid effect. The soundfield added to the experience. No real issues with audio quality emerged. A couple of louder lines showed mild edginess, but the vast majority of the speech remained natural and distinctive. Music was bold and dynamic, and effects killed. Those elements were expressive and impactful, as they showed fine definition and power. While not one of the best soundtracks I’ve heard, this was a very good mix. A running feature, the Hit Counter comes alongside the movie. It displays Agent 47’s “hits” as well as storyboards, concept art, pre-vis footage and facts/trivia related to the video games. Some decent information emerges, but the elements fill so much of the screen that it becomes tough to activate the “Hit Counter” and watch the film at the same time. Three Deleted Scenes fill a total of four minutes, three seconds. We find “Fabian Hanging” (1:52), “Warehouse” (1:15) and “Construction Fight” (0:56). These don’t add much, though the last two give us a little more action. A few featurettes follow. Reimagining Hitman lasts six minutes, two seconds and offers info from producer Adrian Askarieh, director Aleksander Bach, and actors Rupert Friend, Hannah Ware, Zachary Quinto and Ciaran Hinds. “Reimagining” looks at the video games and their adaptation to the big screen, cast and performances, and story/character areas. A few minor insights emerge, but the show usually remains superficial. During the six-minute, 54-second Ultimate Action: Staging the Fights, we hear from Friend, Ware, Bach, Quinto, Askarieh, stunt coordinator Jonathan Eusebio, and fight coordinator Jon Valera. We learn about stunts and action. Again, a smattering of useful details pop up here, but the overall impact seems fluffy. Five Promotional Featurettes take up a total of six minutes, 28 seconds. We get “Around the World” (1:36), “Ultimate Hitman” (1:06), “Who Is John Smith” (1:26), “Creating Katia Van Dees” (1:07) and “Iconic” (1:13). Across these, we get comments from Bach, Askarieh, Friend, Ware, Quinto, Valera, and producer Alex Young. These look at locations, story and characters, cast and performances. As stated by the title, these remain promotional pieces with little substance. Next we find a Comic Book. This comes as a still frame format and shows a prologue to the film’s story, which makes it useful. Making of the Comic Book lasts a mere one minute, 49 seconds. It features Askarieh, Boom! Studios’ Stephen Christy, and comic writer FJ DeSanto. This offers a smattering of thoughts about the Blu-ray’s comic but it’s too short to tell us much. Two Galleries appear. A “Stills Gallery” delivers 12 photos from the film, while a “Poster Gallery” offers 12 ad ideas for the film. The former is a snoozer, but the latter shows some interesting concepts. The disc opens with ads for The Revenant, The Martian and SPECTRE. Sneak Peek adds promos for The Strain Season 2, Homeland Season 4, Maze Runner: The Scorch Trials and The Transporter: Refueled. We also get trailers for Hitman. The package also contains a printed comic book. This duplicates the comic found on the Blu-ray itself. With many elements borrowed from other films, Hitman: Agent 47 never creates its own identity. It also fails to deliver excitement, as it presents a generic, lackluster action tale. The Blu-ray brings us very good picture and audio as well as a mostly superficial collection of supplements. Maybe a third Hitman movie will succeed, but Agent 47 fails to stand out from the crowd.